The Negative Supercharging Cooling System uses a low flow technique that circulates the water 5 times slower than conventional high flow cooling systems to keep the water temperature below 50°C (122°F). The low flow technique is produced by a special coolant flow restrictor with a small tapered hole that produces the optimum coolant flow rate of 23 L/min (5 gpm) from idle to peak rpm. In other words the Negative Supercharging Cooling System circulates the entire cooling system once every 35 seconds from idle to peak rpm. Compared to conventional high flow cooling systems, they circulate the entire cooling system once every 14 seconds at 2000rpm which increases to once every 5 seconds at 5000 rpm. This circulates the water through the radiator too fast which allows the hot water to flow back into the engine before the air flow can draw most of the heat from the radiator. The low flow technique keeps the water in the radiator for a much longer period of time which allows the air flow to draw a lot more heat from the radiator. 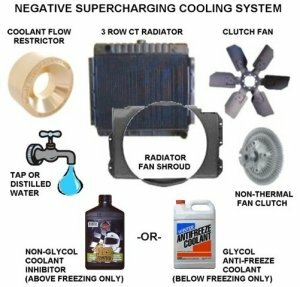 This substantially reduces the water temperature and keeps it below 50°C (122°F) even at high speeds due to the fact that, 1) cold water absorbs and releases a lot more heat than hot water and 2) the higher air flow through the radiator at high speeds draws a lot more heat from slower coolant flow. Therefore, if the water flows faster or slower than the optimum flow rate of 23 L/min (5 gpm), it substantially increases the water temperature above 50°C (122°F). However, for the low flow technique to work effectively in keeping the water temperature below 50°C (122°F) it must be used with the following parts and coolant. The water in the coolant passages of the engine absorb heat from the combustion chamber and cylinder walls to maintain the optimum combustion temperature and prevent the engine from overheating whether the water is hot or cold. However, cold water absorbs a lot more heat than hot water. Therefore, by circulating cold water through the coolant passages it absorbs more heat from the hotter combustion produced by Negative Pressure Supercharging and hot air induction. The cold water prevents the hotter combustion from exceeding the optimum temperature and overheating the engine while allowing the cylinders, combustion chamber, valves, pistons, rings, crank and oil to operate at the normal hot temperature. The ONLY part of the engine that runs cold with Negative Pressure Supercharging is the water in the coolant passages. The engine runs so hot with Negative Pressure Supercharging and cold water that, a) the engine uses spark plugs 5 steps colder than standard to prevent pre-ignition with the hotter combustion and b) when the engine is turned-off, the hotter combustion chamber causes the water temperature to suddenly increase by 35°C (63°F) from 50-85°C (122-185°F). The Negative Supercharging Cooling System is so efficient at keeping the water cold with Negative Pressure Supercharging and hot air induction that when the engine is turned-off, the hotter combustion chamber causes the water temperature to suddenly increase by 35°C (63°F) from 50-85°C (122-185°F). However, when the engine is re-started the water temperature immediately reduces to the optimum 50°C (122°F) operating temperature. High flow water pumps and cooling systems circulate the water too fast through the radiator. This allows hot water to flow back into the engine before the air flow can draw most of the heat from the radiator which prevents the water from running this cold. Chemical coolant that prevents vapour bubbles from forming to improve heat transfer in hot water does NOT work with the colder water temperature produced by the Negative Supercharging Cooling System. This is because the water temperature is too cold to form vapour bubbles and this type of chemical coolant is very poor at transferring heat at colder coolant temperatures compared to water. Water has a very high specific heat, which means it absorbs and releases a lot more heat produced by combustion than all other liquids. For example, adding other liquids to water in large volumes, such as Glycol anti-freeze, reduces the efficiency of water to transfer heat the larger the volume added to the water which reduces the efficiency of the cooling system which causes overheating problems during hot weather.